It was the lavish refurbishments, rather than any particular apparition in the sky, that gave the people of Knock the impression they were in for The Second Papal Coming. 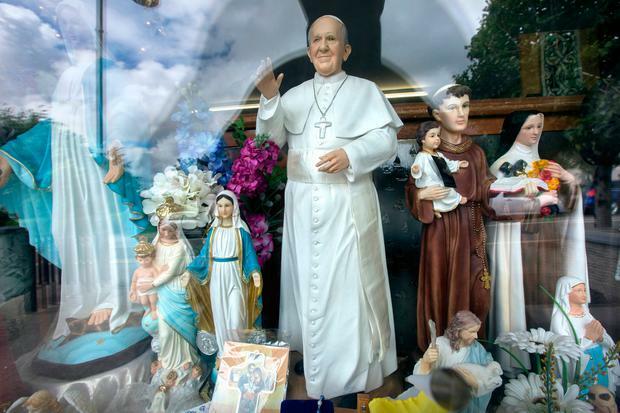 Byrne’s shop sits in a row of businesses selling all manner of Catholic iconography and souvenirs – tea towels, Tupperware, devotional cards, rosary beads to beat the band and an almost life-size replica of 2018’s guest of honour. Former popes might have been made monumental in bronze, but Francis is fabulous in fibreglass – for just under €400.